Marketing is something that’s a little trickier to discuss: we haven’t gone through the whole cycle yet at this point. Super Hematoma is not done and so we don’t have much measure of success or failure. But I’m pleased with the attention that our retrospective received. What with the summer heat kicking in here in my shoebox apartment and Matt still chewing away on the code it’s meant that it’s honestly been hard for me to stay motivated… with the stuff that’s he’s working on just out of my reach it’s meant that I’ve been hesitant to work on more art in case the direction needs to change. It’s also been a little difficult to concentrate due to the temperature in my apartment. Did I mention it’s been warm in my apartment? It seems that it’s pretty normal for there to be slumps in production. I haven’t really discussed it with other developers, but there are enough articles about staying motivated as an indie dev that I’m not surprised to be finding myself in a small one at the moment. What’s interesting is that a lot of that advice is stuff that we had applied right out of the gate when we started. But with distractions popping up in our lives over the past month I’d say things have been derailed a little. Time to get it back on track though. In fact, my fingers are currently quite sore after jamming on the guitar trying to get out a new tune for our next level. What has been encouraging, is the support that we’ve received after posting our retrospective. 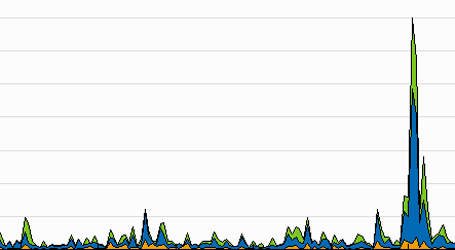 Colored graphs are traffic on Sprixelsoft.com, while the red line is traffic on our IndieDB page. Actually, truth be told, we had some pretty amazing traffic on IndieDB the day I did the write-up on vfx. Traffic spiked up to just shy of 1000 hits that day… which is something I’m not sure how to explain since the last time I did a post about vfx over there it was one of our lowest trafficked news posts. As you can see, while the retrospective wasn’t especially magnetic on IndieDB, it is the first time we’ve received any traffic that is noteworthy on our own website. A lot of those hits came from my post over on reddit, but what I found just as exciting is that we got lots of hits from over at Gamasutra. There are a few things that make me happy about this traffic. It’s traffic from new sources. This means new people that likely haven’t heard anything about us before have now had their first taste of us. We received comments from some of these people. While I’m surprised to see (and curious why) there were down votes on reddit, the response was generally positive. We got comments such as “I wish more indie developers would give us this kind of insight!” and “You guys are awesome and I hope great things happen for you.“. We even had someone who does Lets Play videos asking to be kept in the loop so that they can demo it when we’re ready. How cool is that? 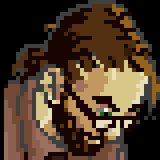 The link to our page was buried in the Gamasutra article. To me, that says that for people to have visited us from Gamasutra, it means that people were actually reading the article. Likewise, I could see that there were lots of people clicking links to the various articles and websites that we’d linked to in that article. Again, this tells me that people actually were reading. This makes it feel like it was worthwhile. It’s a little weird to see our stuff appearing elsewhere on the internet. Like here, or especially here. We’ve even started receiving spam for game development services. Can’t wait to get some more stuff done to show you guys. My fingers are pretty sore right now from trying to jam out a new tune for our next level on my old seven-string.